2014 is already shaping up to be a much more volatile year than 2013, and that has made some professional investors cautious. Consider this: We've already had roughly twice as many "big market swing" days -- when the Nasdaq, the S&P 500, and the Dow close 1% (or more) higher or lower -- than we did at the same point a year ago. The market is always going to have some bumps along the way, but a lot of substantial jumps tend to coincide with really bad years for people who invest in stocks. Last year was a dream for investors. 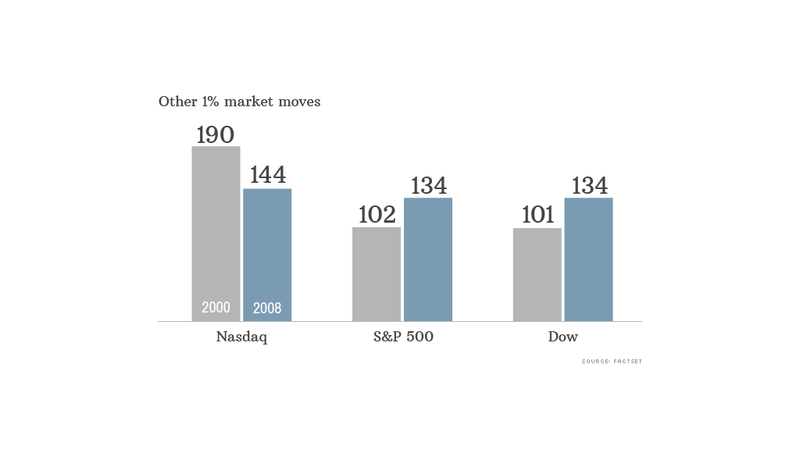 The markets gained almost 30% in 2013. 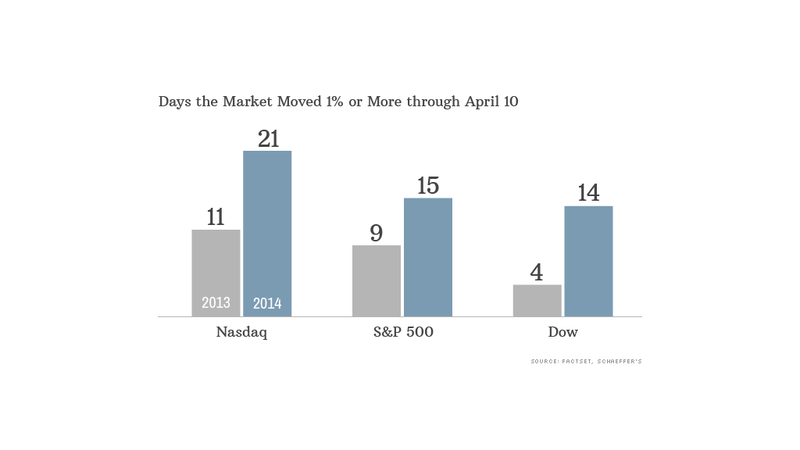 So far this year, stocks are down. The Nasdaq has slid over 4%, the Dow over 3%, and the S&P more than 1.5%. Ryan Detrick of Schaeffer's Investment Research thinks the volatility confirms that while we're not out of the bull market, we're at least on pause. "Bull markets don't come with a lot of volatility. Historically speaking, a lot of volatility does not lead to big up moves," he said. If you look at two periods that were especially rough years for investors: 2008 (financial crisis) and 2000 (Dot.com bust), you can see that volatility doesn't bode well for the bull. Detrick's team predicts that given the volatility we've seen so far this year, 2014 should turn out to be twice as volatile as 2013. That means the "big market swing" day count could look something like this at the end of the year: Nasdaq: 77, S&P: 55, and Dow: 51. When you look at these numbers compared with the amount of 1% or more daily moves we saw in 2000 and 2008, it doesn't seem so bad, does it?